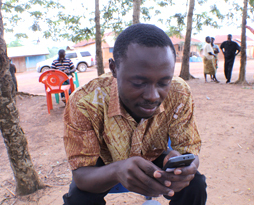 Mobile phones provide cocoa farmers with 24/7 access to relevant advice and information. 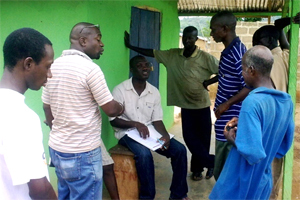 How does the largest chocolate manufacturer in North America communicate with independent cocoa growers in rural Western Ghana? Hershey's Vice President Andy McCormick says, "Just text 'em! Since March 2011, the Hershey Company, World Cocoa Foundation, World Education, and Ghana Cocoa Board (COCOBOD), have been implementing CocoaLink, a public-private partnership. The program uses mobile phone technology to provide cocoa farmers with performance-enhancing agricultural and marketing information. "Because any Ghanaian farmer with a mobile phone can sign up for CocoaLink, we expect more than 100,000 cocoa farmers and their families to benefit from this program over the next three years," McCormick says. Cocoa revenues are crucial to the Ghanaian economy; cocoa exports account for roughly one-third of Ghana's export earnings and generated over US$2.5 billion in 2010. Over 700,000 farmers and their families depend on the cocoa. Because of cocoa's economic importance, Ghana takes efforts to increase production very seriously. CocoaLink will utilize Ghana's rapidly developing mobile phone infrastructure to connect cocoa farmers with useful information about farming practices, farm safety, child labor, health, crop disease prevention, post-harvest production and crop marketing. World Education oversees the technical and community training programs for CocoaLink. The organization has worked to improve the crop yields and livelihoods of Ghanaian farmers and their families since 2009 through implementing the Empowering Cocoa Households with Opportunities and Education Solutions (ECHOES). ECHOES strengthens cocoa growing communities in the Western Region of Ghana by expanding educational and vocational opportunities for youth and adults. World Education's functional literacy and numeracy interventions under ECHOES empowers beneficiaries to apply new technologies to increase crop yields, understand basic business concepts, build networks for sharing and continued learning and capitalize on opportunities available in cocoa-growing areas. World Education and its Accra-based technology partner, DreamOval Ltd, launched CocoaLink activities by conducting baseline Mobile Technology Infrastructure Feasibility surveys in fifteen pilot communities across the country's Western Region. They found that voice and SMS text messages would be viable methods for reaching Ghana's cocoa farming community with information to improve their productivity and yields. Roughly 85% of Ghana now has mobile phone coverage, and more than 65% of Ghana's rural residents have access to mobile phones, including many of the 700,000 cocoa farmers. CocoaLink information will be available free of charge to any cocoa farmer with access to a mobile phone. For the CocoaLink initiative, World Education is providing crucial community engagement, training, and local implementation guidance, working with CENCOSAD, a local NGO partner, local community facilitators, and CocoaLink farmers. World Education staff members interact with farmers. Project facilitators are extremely optimistic. Tawiah Agyarko-Kwarteng of World Education says, "CocoaLink is truly the right program at the right time. It is building on Ghana's growing capabilities in mobile technology to help farmers grow quality cocoa, increase family income and expand opportunities for their children and communities."